Anyone for a Chain and Anchor Mooring System? Another busy run around this week! Teams off to Bedford and Oxford for installs, a few pallets and deliveries going out around the UK made up of modular cubes, V cubes, accessories and moorings. One exciting delivery to Durrell Wildlife Conservation Trust at Jersey Zoo, a couple of last minute pallet deliveries, site visits and check ups, and all the usual enquiries and estimates to be completed and replied to! Phew…..it’s all been go go go! After all this, we’ve realised that April is fast approaching and we needed to sort another Monthly Offer for you. So this months offer is on something that will be needed for a lot of floating pontoons …. 10% off a chain and anchor mooring system! We will take 10% off the anchor, the chain and shackles for you. The offer is on these three products only, delivery not included. Offer is valid on bookings and purchases made from 1st April (no joke!) to the 30th April. 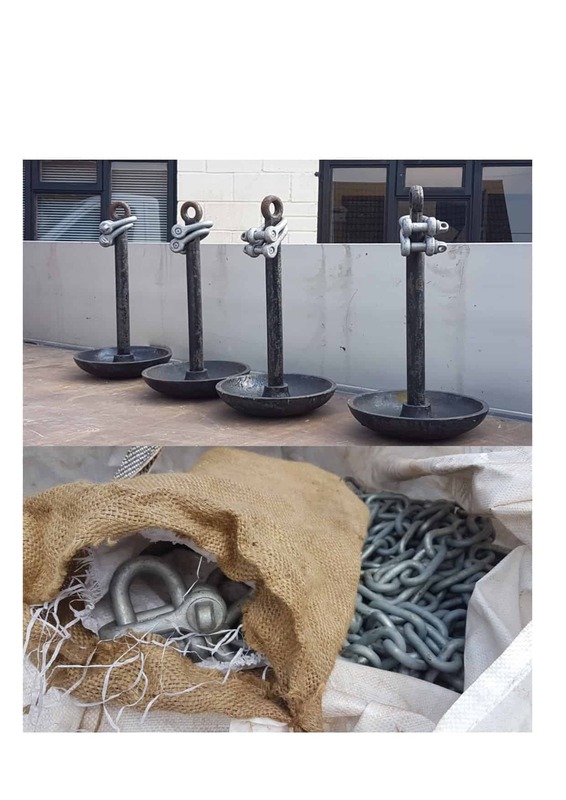 We have a variety of anchors at WMS, including 30kg and 50kg AP (Admiralty Pattern) anchors, Mushroom anchors and Danforth anchors. We can nearly always source other types if needed. AP anchors have a high holding design and are generally the best option for mooring systems that incorporate two or more in line anchors. They come in weights of 30kg to 150 kg. Mushroom anchors are similar to AP anchors, but are less expensive . They are a good overall anchor for a variety of seabeds but are most effective in mud/silt. Mushroom anchors can be purchased in weights of 11kg to 90kg. Danforth anchors sit flat on the seabed making them ideal for shallow waters. They are available from 50kg upto 250kg. The size of chain to accompany the anchors is calculated by load, but the length should always be at least three times the depth of water at HAT, to ensure the anchor stays put. The chain will be fixed to the pontoon and anchor with the shackles, and it should always feed towards the opposite side of the pontoon, so the chains cross under it, allowing other boats and water users to pass without the chain catching them. If you have any questions about your mooring system, please give us a call or send an email. A ‘Quiet’ Week That Wasn’t, and a Very Happy Easter! We’re hiring! Meet the team…..